Marble disease (synonym: disease Albers - Schoenberg, osteopetrosis familiaris, osteopetrosis congenita diffusa, myelosclerosis congenita familiaris, osteosclerosis fragilis generalisata) is a rare congenital family diffuse osteosclerosis or osteoporosis (fossil) a significant part of the skeleton. Marble disease occurs in men and women, and the elderly and children, and rarely in newborns and fetuses. About half of patients with no clinical symptoms; in these cases, marble disease is detected at x-ray examination of the skeleton on another occasion. Bones affected M. b., are very brittle; detection of broken sklerozirovanie bones need additional x-ray examination of other departments of the skeleton for the detection of M. B.
Pathological anatomy. The essence of pathological changes in marble disease is the thickening of the cortical layer of the bone, and the narrowing of bone marrow space, progressive osteosclerosis, accompanied by a sharp compaction with simultaneous brittle bones and anemia of different severity. The bones of the skeleton with marble disease heavy, hard-portioned, however, easily split, cut with a homogeneous smooth surface, resembling polished marble. The most pronounced changes occur in the growth zones bones in the lower third of the thigh and the radial bone in the upper third of the shoulder and tibia bones, where the intensity of the process visible typical kolloidnye flatulence (Fig. 1). Medullar channel or sharply narrowed, or completely replaced by dense bone (printing. Fig. 3). The same dense bone substitutes cancellous flat bones (skull, collar bones, vertebrae). In the bones of the skull is marked narrowing of holes with pressing on a nerve, causing develop deafness and blindness. In the area of the ends of the long bones can occur belt rarefaction of bone tissue, indicating a temporary suspension abnormal bone formation. The osteosclerosis with marble disease occurs mainly due to the enlargement of angosta. Observed sometimes expansion of the periosteum lead to the formation of the surface of the compact, and spongy bone. 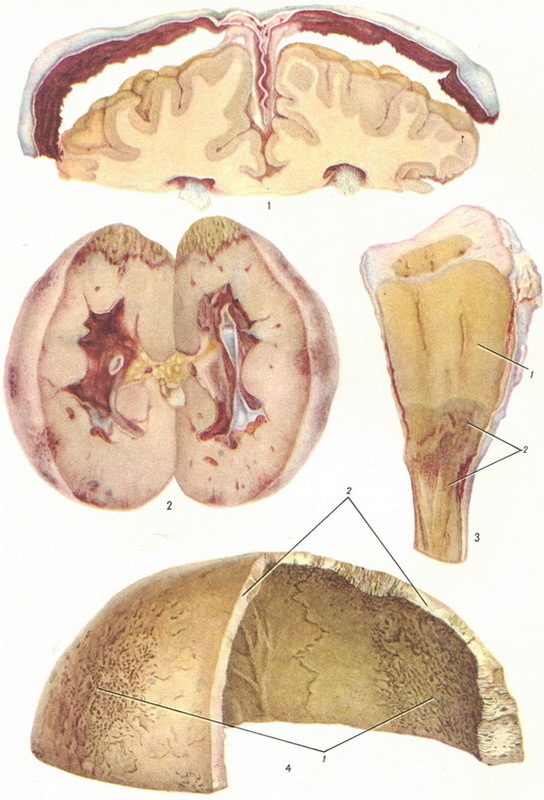 In connection with this restructuring of the cortical layer, which is called maturitatii, the bone surface becomes rough, dotted with reddish stripes because of the presence of the red bone marrow between the newly formed bone beams (printing. Fig. 4). This medullate in the bones of the skull can serve as a source of epidural, and sometimes subdural hemorrhage (printing. Fig. 1). Fig. 1. Massive subdural hemorrhage, which developed as a consequence of metallization of the skull bones. Fig. 2. Diffuse extramedullary hematopoiesis in kidney, hemorrhage into the cavity, pelvis and under capsule (boy 4 years). Fig. 3. The lower third of the thigh at a cut that consists of compact bone tissue (bone marrow channel is missing): 1 - compact bone tissue; 2 - zone of more porozni bone. Fig. 4. The bone from the cranial roof with marble disease: 1 - medullate compact layer, giving the surface of a bone a kind of rough sponge view; 2 - sawing on the cancellous bone substituted compact. Fig. 1. Changes bones with marble disease. Fig. 2. The formation of layered rounded structures in zones encontrarnos growth in the vertebra. Histological examination of the bones determined a sharp increase in the mass bone substance, his messy pile, accumulation formless bone structures without signs of their resorption. Osteoblasts are located unevenly, osteoclasts almost never occur. Characterized by the formation of layered rounded structures, lying randomly in areas encontrarnos growth (Fig. 2). Architectonics bones as a result of this accumulation of bone structures loses its functional character, why is loss of bone strength in marble disease (I. P. Vinogradov). In the spleen, lymph nodes, liver, and sometimes kidney observed the development of centres of extramedullary hematopoiesis increases the weight and volume of the listed bodies (printing. Fig. 2). Death from M. B. occurs when the phenomena of growing anemia or septicopyemia, which are purulent osteomyelitis (often facial bones), emerging as a result of pathological fractures. The pathogenesis of M. B. remains not clear. The most widespread point of view on M. B. as dysplastic process that occurs in the womb and are inherited in a recessive trait. M. B. more sick children spouses in kinship. A. Century Rusakov believed that, with marble disease occurs disharmony in the development of bone and blood tissue, which makes it a congenital condition with osteomyelofibrosis adults. When prevails loss of bone that occurs benign variant M. B. If in the process involved and myelogenous fabric, developing malignant option M. B. with severe anaemia and death. Clinical symptoms M.B. (if they exist) are reduced to spontaneous fractures of long tubular bones (often in the absence of an overload). In diaphysis these fractures (as a rule, the cross) is usually rapidly converging. There are a lot of cases of hip fracture; usually they are not converging. With the defeat of the skull base may be impaired vision and even become blind in the result of the compression of the optic nerves in the visual hole. Some children who are blind from birth. Rarely affects other nerves. Rapidly growing osteosclerosis can lead to severe progressive anemia (see). Often there is a hard place odontogenic osteomyelitis (see). X-ray diagnostics. The x-ray of the affected bone are unstructured white, like a marble image. On the prints with x-ray (on the positives bones are black; bone marrow space is limited and can even be completely filled thickened cortical layer (Fig. 3). This applies to short and long tubular bones, and mixed to flat. Endoteliyu sclerosis is a consequence of inborn reduced activity of osteoclasts in the normal formation of bones by osteoblasts. Usually the osteosclerosis expressed more sharply in the pelvis, lumbar vertebrae, somewhat less in the area of the skull base, often in long tubular bones, as in diatezah and epiphyses. More rarely, it is found in other bones. Apparently, marble disease in an earlier phase is manifested in the form osteosclerosis in metaepitome areas bones. Note that in broad and tubular bones unaltered skin area, surrounded by a sclerotic border, can simulate the cavity, and some small areas of sclerosis simulate curtailment. Generally unchanged areas bones contrast sharply with sklerozirovanie. Marble disease must be distinguished from osteosclerotic anemia, myelofibrosis, fluorosis, chronic poisoning by heavy metals and phosphorus, sclerosing cancer metastasis (especially prostate cancer and Hodgkin's disease. Treatment of symptomatic, radical means no. People who M. B. proceeds without clinical symptoms, often live to a ripe old age. Fig. 3. Marble disease in women 40 years: 1 - diffuse osteosclerosis tel lumbar vertebrae; 2 - sclerosis bones of the upper limb and back sections of the ribs; spinous processes of sclerotic (fibrous); joint and cross branches have maintained normal structure; 3 - non-consolidation of a fracture of the femur. Diffuse osteosclerosis almost all of the pelvis and the proximal thighs.